1. Preheat the oven to 200˚C, gas mark 6. Toss the potato wedges in a tray with 1 tbsp oil, the paprika and chilli powder, then season and roast for 30 minutes until tender. Meanwhile, line a large chopping board with cling film, spread out the chicken breasts on top and cover with another sheet of cling film. Bash with a rolling pin until 1cm thick all over. 2. Put the flattened chicken in a medium resealable food bag with the remaining 1 tbsp oil, the lime zest, garlic and Tabasco. Season and massage through the bag to coat the chicken evenly; set aside for 10 minutes. Meanwhile, roughly mash the avocado and lime juice together; season and stir through the coriander. 3. Heat a large griddle or frying pan over a high heat. Cook the chicken for 4 minutes on each side, until cooked through, then set aside. 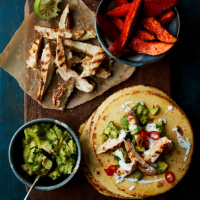 Heat the tortillas, then serve with the wedges, guacamole and sliced chicken, plus natural yogurt and a scattering of sliced red chilli. Flattening chicken breasts like this is a great way to ensure that they cook evenly when frying.